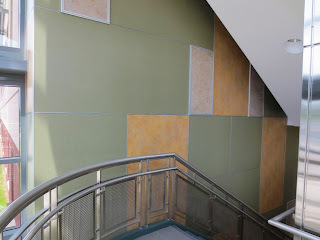 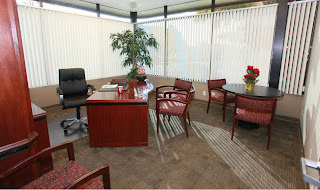 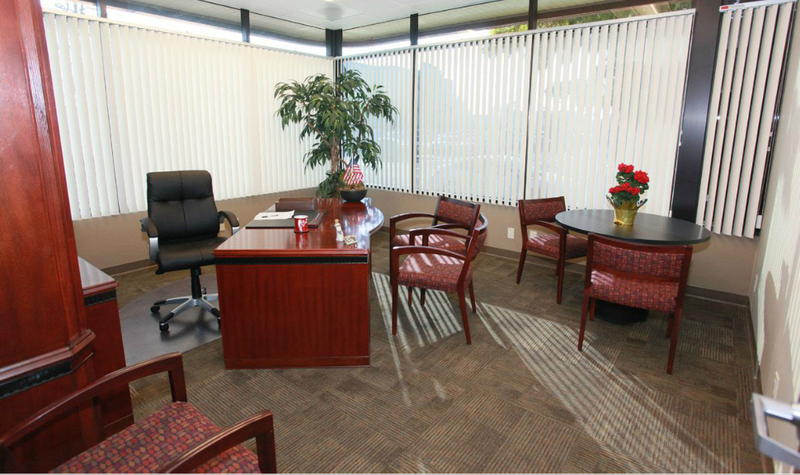 Historically, Marlite has been best known for its durable baked finish paneling in a multitude of colors and finishes. 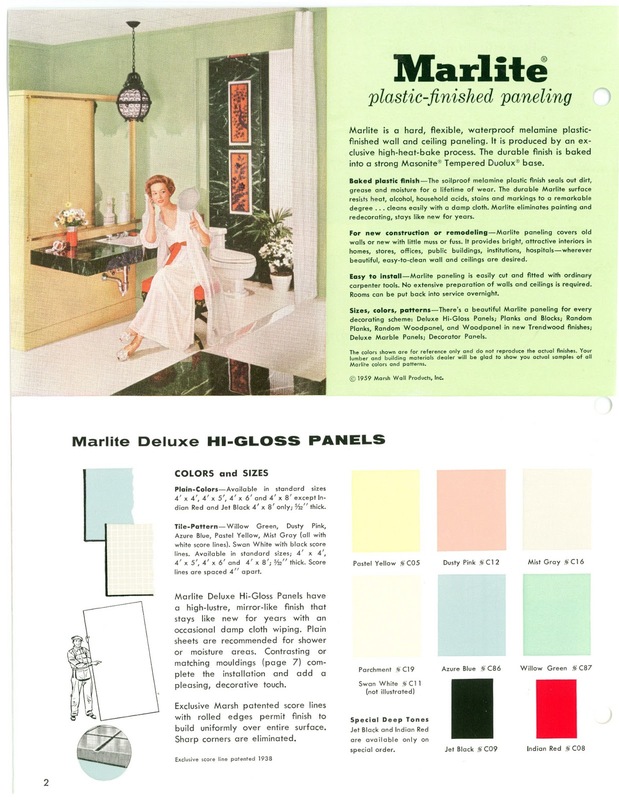 The company promoted its panel products aggressively and created great advertising in the 1950's. 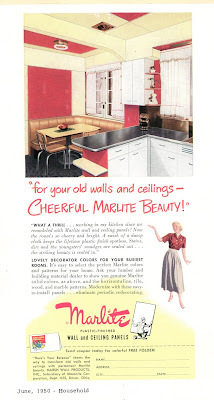 Today’s feature look back at Marlite’s earliest era. 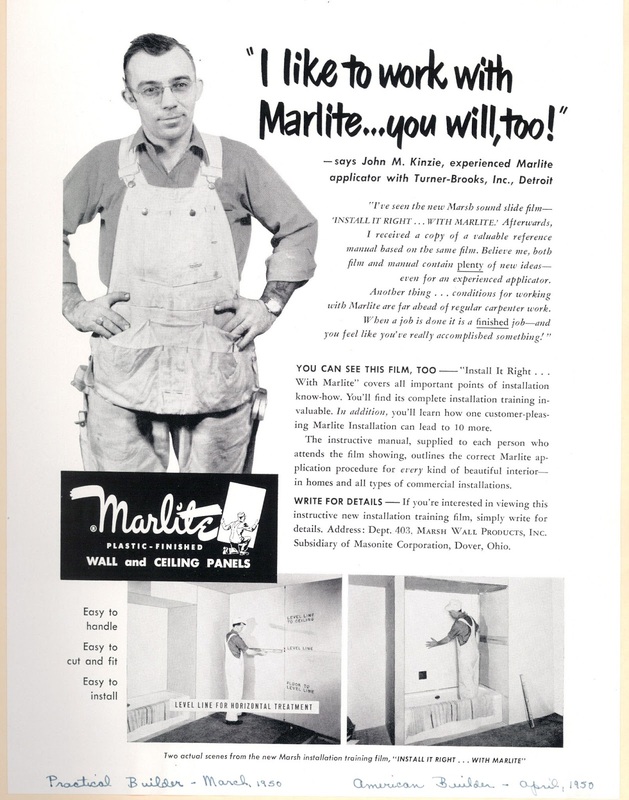 Originally, Marlite products were exclusively marketed for residential construction and remodeling. 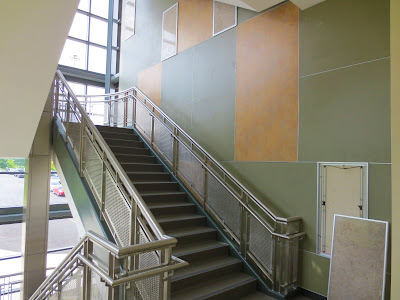 The panels were installed "without muss or fuss" – a homemakers dream – beautiful, easy to clean and resistant to grease, stains and dents! 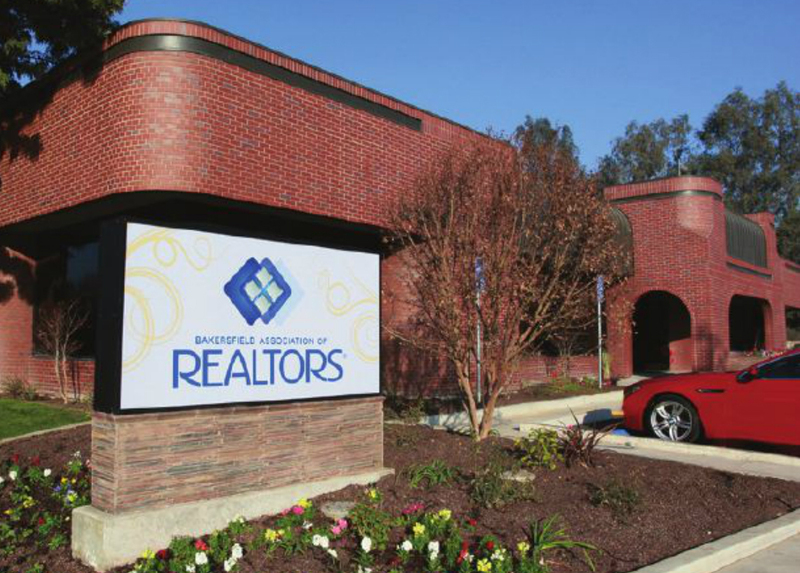 The ads specifically targeted two groups of people – the “stay at home” housewife and the “do it yourself” husband. 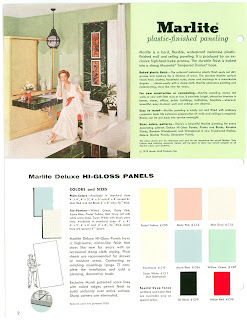 The deliverables in the ads show a very pleased wife, proud of her new showplace featuring attractive walls and ceilings. 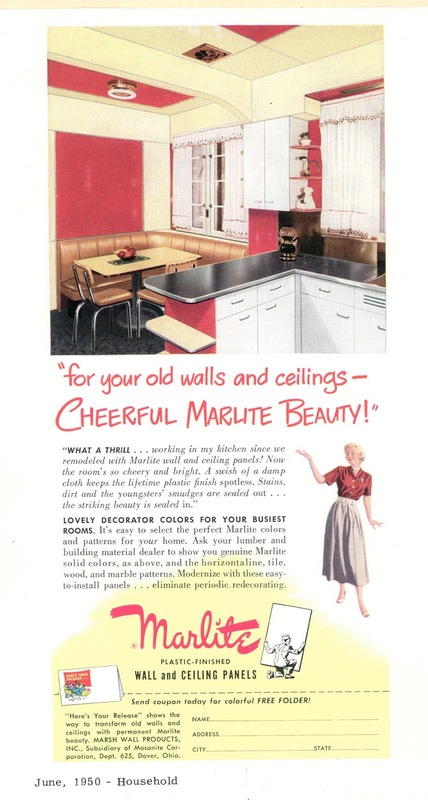 "What a Thrill, working in my kitchen since we remodeled with Marlite wall and ceiling panels!" The husband takes great pleasure in applying “easy-to-install” Marlite paneling – a simple weekend project yielding short-term satisfaction and long-term visual appeal. 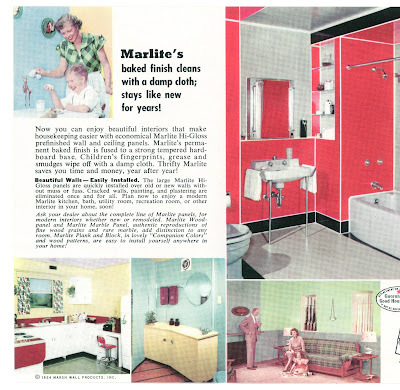 Founded in 1930 by Alvin and Victor Marsh, Marsh Wall Products Co. was noted for its decorative, functional and durable "Marsh Tile" for bathrooms and kitchens. 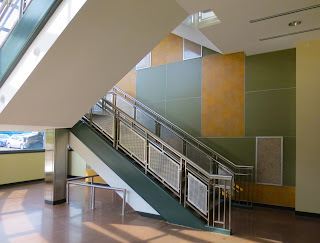 The product, with grooves resembling tile, was made of hardboard and finished in a tough scratch and moisture-resistant topcoat melamine for unmatched surface quality. 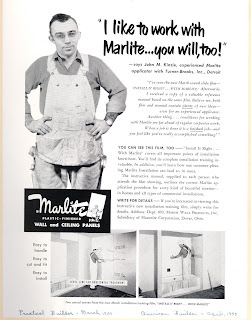 Later known as Marlite, in 1948, the company became a subsidiary of the Masonite Corporation, the supplier of the hardboard substrate used in the panel’s production. Even today, many associate Marlite with the "hard, melamine plastic finished wall panel” it produced over sixty years ago. 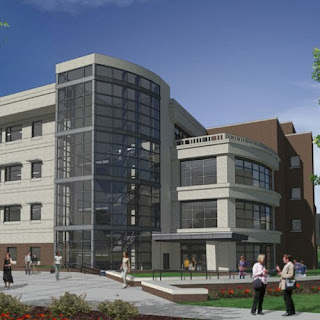 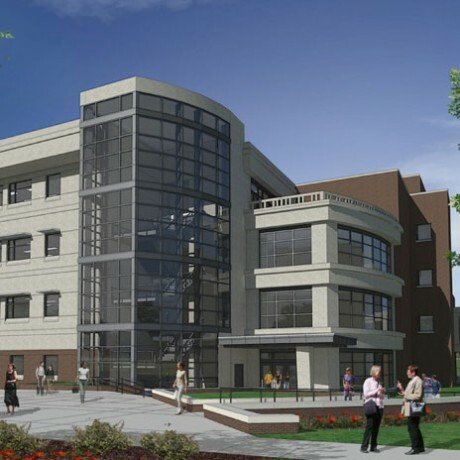 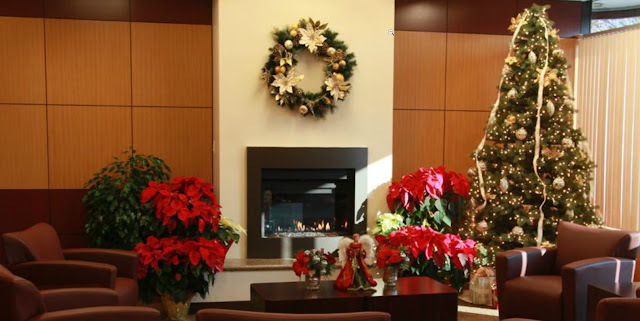 But Marlite has grown into a leading manufacturer of interior wall systems for commercial markets – including restaurants, health care facilities, schools, stadiums and corporate offices. Offering products like Surface Systems with exotic wood veneers and Myriad featuring translucent backlit materials, Marlite’s evolution surprises those with pre-conceived notions from the past. 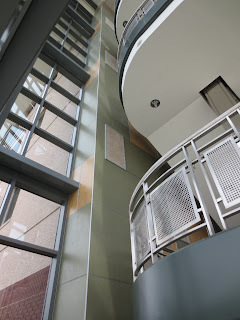 At the same time, Marlite is viewed as an innovative company with an incredible number of design possibilities for the newest generation of interior designers.